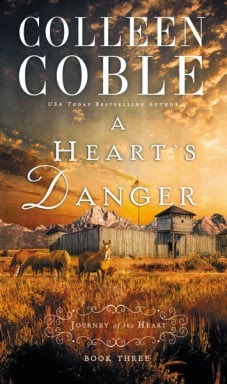 It is time for another review of the Journey of the Heart series by Colleen Coble. This time, I'm reviewing book 3, A Heart's Danger. Previously, I have reviewed A Heart's Disguise and A Heart's Obsession. I feel a bit off about those reviews, now that I've gotten through the third book. I was not particularly liking the main characters, and I know some of my problem had to do with the fact that Sarah (female lead character) lost her dad. Her mother had died years before. I'm not handling books about people who are going through the death of a parent very well. I like Sarah a lot more now that she is in Wyoming. Her compassion for the Sioux living near the fort is wonderful, and her determination to move on and make a good life for herself and her brother is certainly commendable. This portion of the series is action-packed, with lots of fairly unlikely coincidences that didn't annoy me as much as I expected. Unlike the first two titles in the series, this one comes to a nice conclusion that doesn't leave me anxious to get the next in the series. At this point, I'm curious as to where things will go as we move into book four, but no pins and needles are involved. I would highly recommend starting with book 1, as I really don't think these titles stand alone.